Whether you’re an officer who wears the badge or a resident who fears the badge this talk is sure to challenge your understanding of what’s possible through law enforcement. 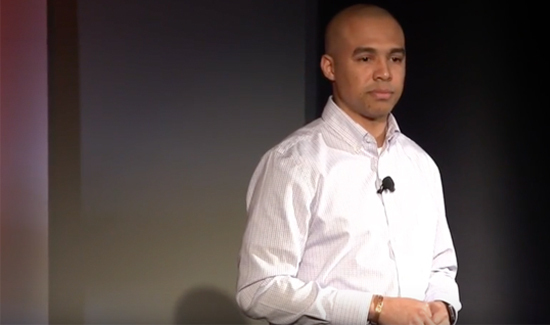 As a social worker who now runs a police agency, Derrick Jackson has a unique perspective on bridging the divide between community and the police. Derrick Jackson, above, serves as the Director of Community Engagement at the Washtenaw County Sherriff’s Office. He comes from a somewhat unlikely background for a law enforcement officer, graduating from Eastern Michigan University with a Bachelor in Social Work in 1998. While receiving his Masters in Social Work from the University of Michigan, Derrick worked with W.J. Maxey Training School where he had his introduction to the criminal justice system. In 2000 he began his work at Ozone House, working closely with at-risk young people in Washtenaw County. With a background in direct service, community organizing, and politics he continues his commitment to the community by serving on numerous local boards, committees, and by volunteering with several youth programs. Derrick can be reached via email at jacksond@ewashtenaw.org or by phone at (734) 891-2243.